I have been meaning to share D's birth story for a while now. 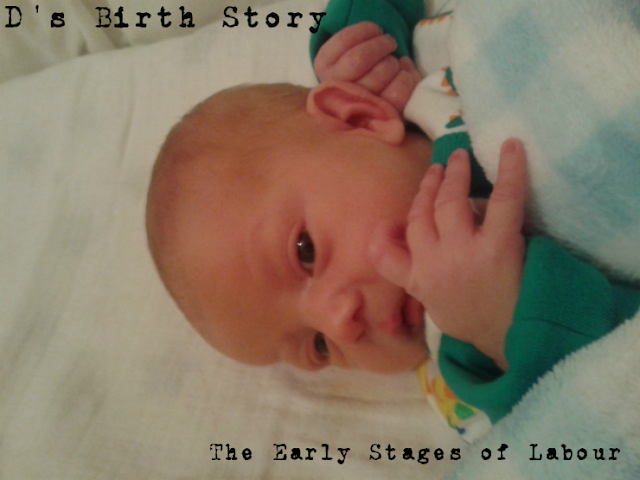 I've shared Baby S's Birth story already. It ended up having a part 1 and a part 2. I thought it was finally time I got around to sharing D's which was a whole other world in comparison. My pregnancy with D was pretty normal. I had no real complications, I wasn't high risk and I only had my normal doctors and hospital appointments. With just under 3 weeks to go before my due date I had not been expecting my 'show' but in the late morning it came anyway. 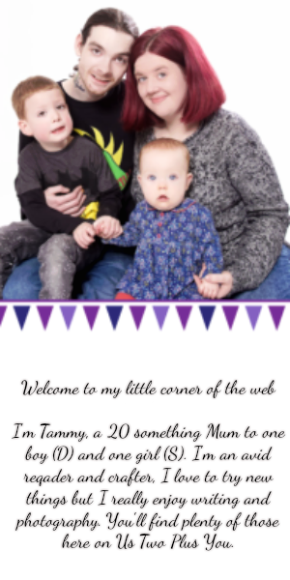 I remember panicking about it and rushing to the phone to call my midwife. She calmed me down, it's normal and doesn't mean labour is going to happen right away. I knew this already of course, after going through the birthing classes and all the research I did while pregnant, I knew it. It didn't seem to matter, I still panicked. Over that same day I did start getting contractions, they did stay regular and slowly they got more painful. By that evening we called my dad and headed for the hospital. I was in a fair amount of pain at this point. We took our bags with us and waited to be seen. After a check on the monitors and some of the usual tests, we got sent home. I was 2cm! This thing was really going to happen way before 40 weeks! I took some pain relief and tried to sleep. Come the next morning the contractions hadn't stopped, they had eased a little although I am still not sure if I had just gotten used to them over night. The important thing was that they hadn't gotten worse. I remember trying to keep myself busy, I cleaned our little flat from top to bottom in a panic that time really was running out. We'd been told to stay active and walk around in an effort to keep up some sort of progression. We decided to take a walk into and around town which did get things moving along a little bit. By the time we got home and tried to relax for the night the pain was getting worse and we ended up back at admissions. Not much had changed and I'd gone to 3 cm. I remember feeling so frustrated, I was in a pretty good amount of pain but it seemed to be nothing. I was already wondering what this was going to be like at 10 cm if I was in a lot of pain already. Another day and again I hadn't had much change. The contractions had stopped over night but slowly came back throughout the day. I had cleaned as much as I possibly could and we had taken a short walk. I thought we should try a longer walk, I'll never forget this decision. We thought it would be a good idea if we walked to what we thought was a local big shopping centre that was 'only up the road'. We had actually planned to get a taxi there and walk back since we didn't know all the directions. Ahh how bad I was at Google Maps back then! There just happened to be a small car accident right at the corner of our street which was also on a really busy main road right to the city centre, during rush hour! So that plan quickly went out the window. The lady who worked at the taxi place gave us directions and said "It's not that long a walk, you'll be fine. A nice walk while pregnant." I strongly dislike this woman. We headed off and after an hour it became very clear that 1) This place was most certainly not anywhere near us nor was it in walking distance for a pregnant woman and 2) We had no idea how much longer it was going to take to get there but going back would also take another hour. We decided to keep going. I swear it was at least another hour before we got there! It probably wasn't but it was already dark and we'd left while the sun was out. I was just thankful it didn't rain. We did stop a few times and have a little break. After we eventually got there we grabbed some bits we might need if I did go into hospital along with the usual bread, milk and extras as a treat after that walk! We did get a taxi home and after a quick shower we tried to relax a little together. I had been wearing a pantie liner since anytime D moved in the right place I was finding I was peeing a tiny bit. (Nothing an 19 year old wants to be doing I can tell you.) It was feeling damper than usual after a short space of time. I was now standing over beside our kitchen counter moving my body from side to side to try and ease the pain. Yet again we headed to the hospital. I was feeling bad at this point about having my dad travel down to us over and over again. This time things had actually changed, I was still 3 cm and having regular contractions but my water bag had started leaking. Which meant that in the next 24 hours we would be in hospital until baby was born. It was around this point that they told me he was still back to back, which at the time didn't mean much to me. They did say he should turn during labour. What they didn't mention was that back to back labour is incredibly painful, more so than a labour where the baby is in the right position. We did get sent home again, this time we had an appointment for 12pm the next afternoon to come in for induction. We didn't actually head home, we ended up at my dad's house.It made more sense to be there should something happen he could take us straight to the hospital in the middle of the night. I remember someone suggesting I would be able to get a long hot bath and thinking how great that would feel. I couldn't, once your water breaks you can't get a bath without risking an infection to the baby. It didn't matter anyway, my contractions completely stopped and I got some much needed sleep. Just before 12pm the next day we headed to hospital after getting freshened up and getting everything we needed ready. As usual I have ended up writing much more than I had intended and unless I plan to write as though there is no tomorrow I will have to cut this story in half too. The last half will go up next week, come back to see how my back to back labour went, other than getting to meet my perfect little boy.